This is one of the popular dessert soups in Malaysia. I like to use coconut sugar “gula Melaka” 椰糖 for making this dessert; it does bring out the nice fragrant that is hard to describe. Unfortunately, I can’t find “gula Melaka” here in US and I have to bring some from Malaysia. I tried using palm sugar (available here in Asian grocery stores) but it just doesn’t taste the same. 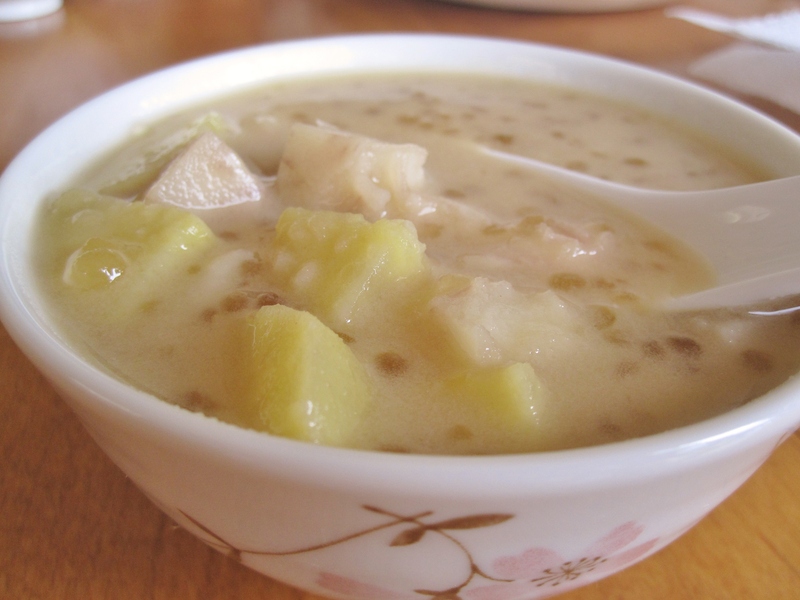 Also, the other ingredient to make this dessert soup fragrant is fresh pandan leaves. I can’t find any fresh pandan leaves (and I don’t want to use pandan juice/extract because I don’t want to turn it to a green soup), so I skip it. In a small sauce pan, boil 1/3 cup water and coconut sugar “gula Melaka” until sugar dissolves. Sift and set aside. Cook sago balls in a different pot with enough water until sago is transparent. Drain and rinse under cold water. Put cooked sago balls in a bowl with cool water so they don’t stick together. Boil 5 cups of water and fresh pandan leaves (if used) in a medium pot, cook taro for 5-8 minutes then add in sweet potatoes. Cook until taro and sweet potatoes are soft. Stir in coconut milk, coconut sugar syrup and sugar, bring to a boil. Remove from heat and stir in cooked sago balls. Serve hot or cold. Sago balls: soaking sago balls briefly will speed up cooking time and help cook through the center of the balls.